When he recently decided to open a west coast branch of his digital marketing agency SEER Interactive, Philadelphia-based owner Wil Reynolds knew the three-month stay in San Diego meant temporarily relocating his family, including his six-year-old lab-pit-bull mix Coltrane. Rather than flying the dog in cargo, Reynolds did the drive cross-country, using GPS to locate a baseball field every four to five hours where the dog could chase fly balls. Reynolds is among the doting working doggie dads taking their pets on the road for business. While an exact number of pets on business trips isn’t tracked, the American Pet Products Association says that almost a quarter of pet owners take their dog along when traveling for two nights or more. (Dogs are the most well-traveled species; only two percent of cat owners took Fluffy along). These bonds are big business with more than $53 million in pet expenditures according to the APPA. The travel industry has taken notice, making things easier for ‘treps to take their pets on the road. In 2012, the American Hotel & Lodging Association found that 61 percent of properties permitted pets, up from 52 percent in 2010. Airports from Boston to Burbank offer pet relief areas and some, including Dallas Fort Worth and Washington Dulles, host pet hotels. Though pet travel has gained traction in the past decade, it can still be a challenge. Melissa Halliburton ran a Boston-based coupon company in 2002 when she encountered a lack of resources for finding hotels that would take her and Rocco, her Chihuahua-Jack Russell mix. That frustration begat BringFido.com, a web site she launched in 2005 to identify and book dog-friendly hotels. It initially listed 10,000 US hotels; now that figure has nearly doubled to 19,000 domestically, for a total of 50,000 globally, but still a fraction of available hotels. Today, about 20 percent of the web site’s users are business travelers. 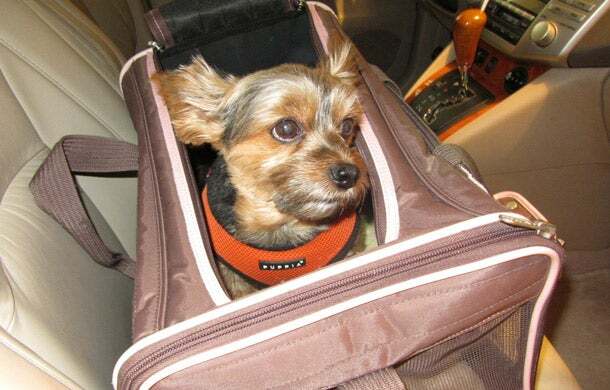 Business travel with pets means being prepared for the unexpected, as Teddy, a Yorkshire Terrier, has taught his owner Terri Slater. Having a furry travel companion can even make financial sense, depending on the trip. A one-way plane ticket might start at $125 with many major carriers, but boarding can range from $30-$50 nightly, a fee that adds up for long jaunts. “Economically, it’s usually cheaper than boarding,” said Halliburton. Of course, traveling with animals means planning for the unexpected. Independent Florida-based publicist Terri Slater and her husband realized their Yorkshire terrier Teddy needed to go outside just before boarding a flight at New York’s Kennedy airport. “I’m standing already through security and waiting with a panicked look on my face,” said Slater, who eventually made the flight and continues to travel with Teddy monthly for work.